The ruffed lemurs are the largest of the lemurs, and the fur of the black-and-white ruffed lemurs is blotches of pure black or white. In the north, they will sport more black, and in the south more white. The face and top of the head are black and they have bright yellow eyes and a white ruff around the face. The hands, feet, and tail are also usually black. 19 years in the wild. 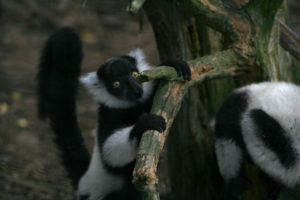 There are 3 subspecies and they are found within the eastern part of Madagascar in patches of land. By 3-4 weeks the babies can attempt to follow their mother. The young are independent at 4 months and reach sexual maturity around 20 months. Their diet consists of fruit, seeds, leaves, and nectar (which it eats using its long snout and tongue). 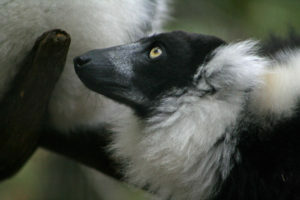 The ruffed lemur is considered a specialized frugivore (fruit eater). They are primarily active in the early morning and late afternoon. 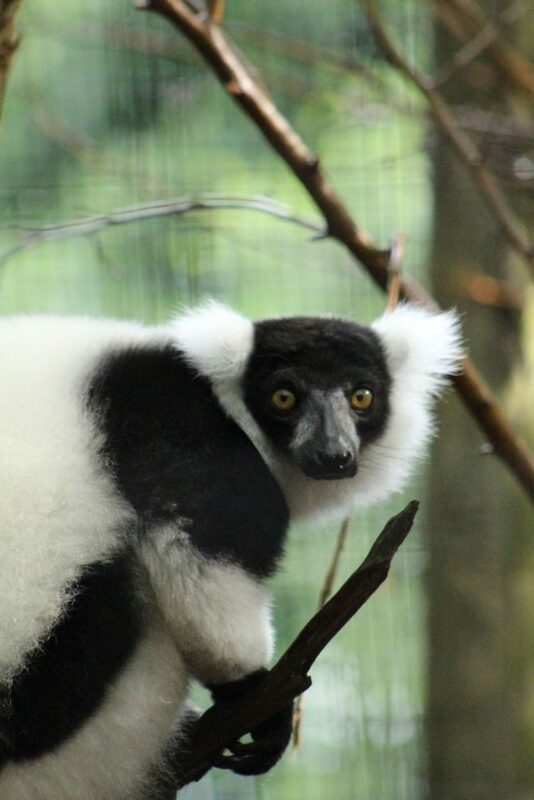 The Ruffed Lemur will travel by walking or running on branches and leaping from tree to tree. Females head groups and will defend their territories. 1. They have deep, barking alarm calls used to defend their territory. 2. 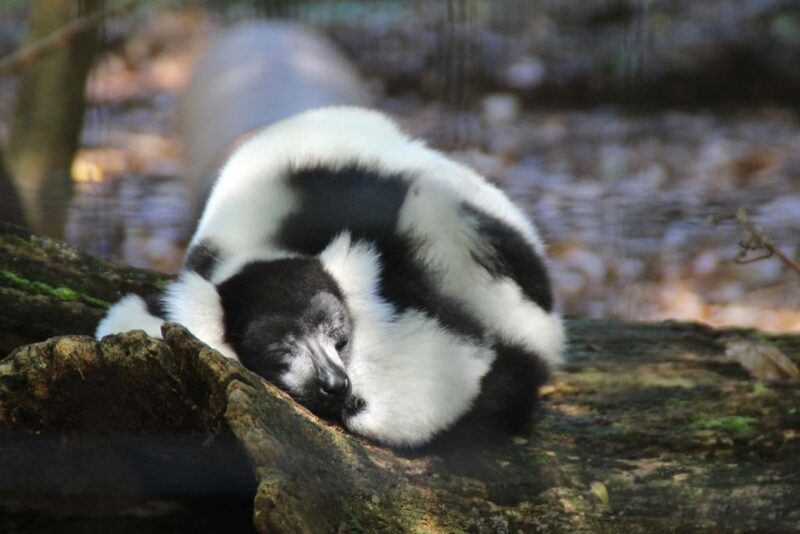 Due to its diet of nectar, this lemur has developed a close relationship with the traveller’s tree. They get nectar from the tree’s flowers and help distribute pollen to other trees. 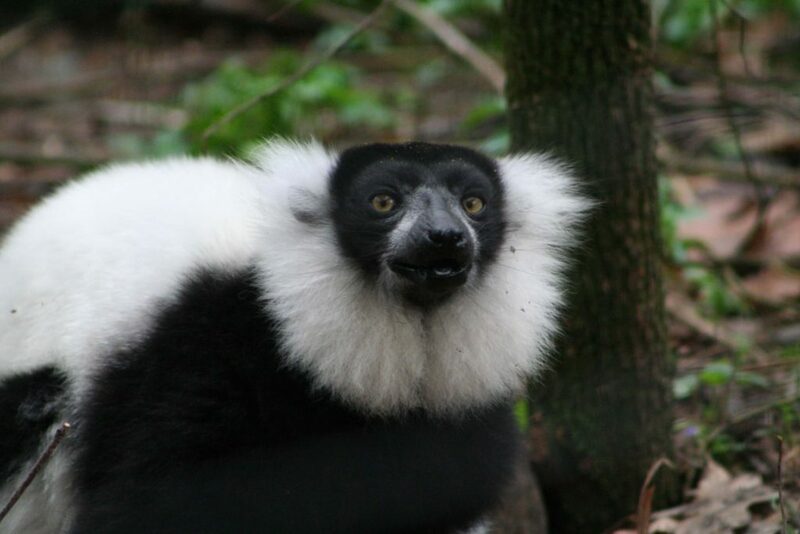 Because of this, the Ruffed Lemurs are the largest pollinators in the world. 3. These Lemurs give birth in nests made 10-20 meters above the ground. Because of this, there is a high mortality rate (65% due to accidental falls and related injuries. 4. When infants are born, they are not able to grip their mother, so must be carried. As such, the mother can only transport one baby at a time. 5. They commonly exhibit suspensory movement, meaning they are adept at hanging from their feet.